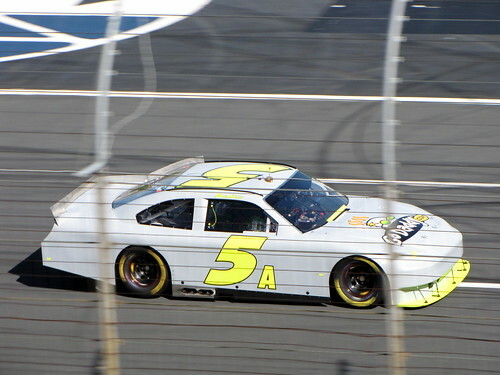 Yesterday I went out to the Charlotte Motor Speedway to watch NASCAR test the new spoiler. I was unaware of the test until all the people in my Twitter NASCAR list started talking about it. I got out to the track around three and stayed for an hour. There was a small crowd so I was able to park in the lot right in front of the track's main entrance. 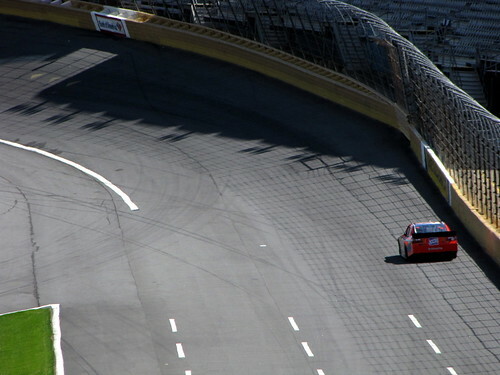 One of my favorite sounds is what you hear when you are outside the Charlotte Motor Speedway and you can hear individual cars going around the track. You can hear the engines rev up and slow down as they leave and enter the corners and there is a reverb to sound unlike any other. It's impossible to not start walking faster as you get closer to the track entrance. As far as removing that wing and putting the spoiler back on: hooray! 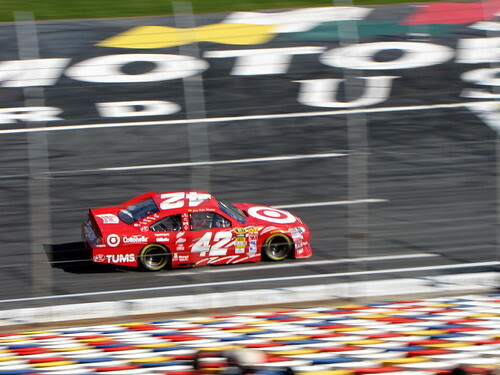 The cars look like race cars again, not something a teenager would drive to impress girls. 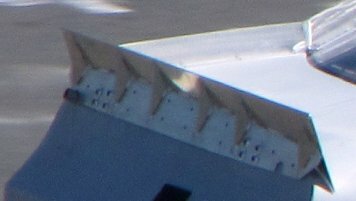 I never did cotton to the wing because of how it looked and because it made the cars more susceptible to going airborne during a spin. So good riddance. Even the drivers prefer the spoiler over the wing. They will be testing today from 10-3 and the grandstands are open to the public and it's free to get in. No charge to watch cars go 190 mph. You can't beat that. I took a few pictures while I was there. Here is why we were all there. A spoiler on the back of a stock car, just as God intended. Mark Martin. I'm really happy with this picture. It's hard to pan and capture an image this tight when your subject is going 180 mph. 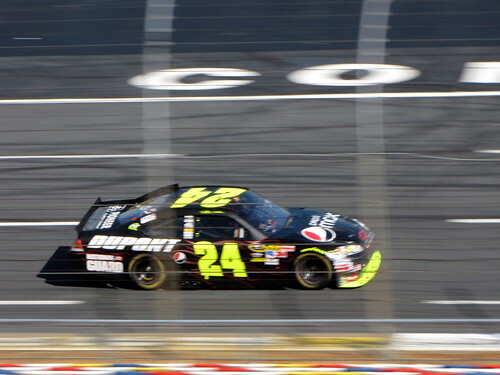 Jeff Gordon. I like the black car. I'm not sure who this is going into turn 1 but I like it. I tried this shot about ten times and three were not of an empty track. 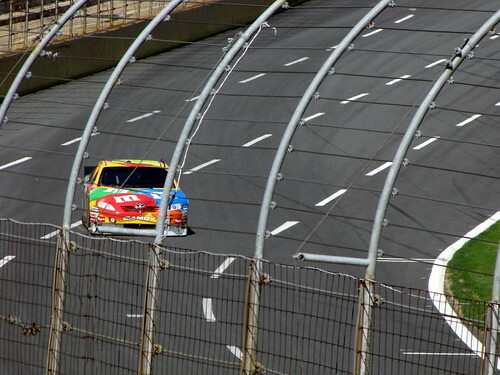 Kyle Busch approaching the start/finish line on the front stretch. 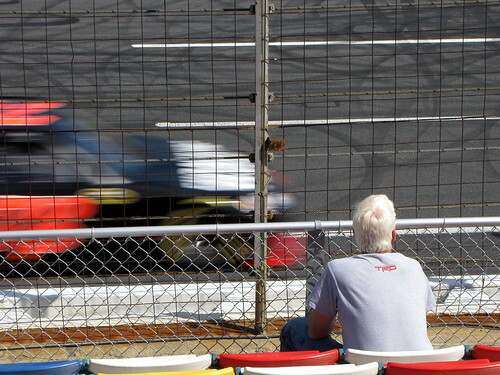 That is a great picture of Mark Martin.